Well, I must admit I've always been pretty good at keeping secrets but I just have to share this one with you. . . ! If, like me you are starting to worry about the appearance of fine lines and wrinkles and also want to improve the general appearance of your skin then I may just have the prefect solution for you right here . . . 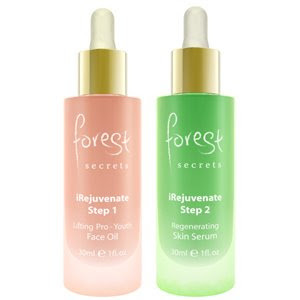 I am so LOVING the new Forest Secrets iRejuvenate System which is a 100% natural skincare duo which aims to lift, tighten, brighten and iron out all of those annoying little lines and creases! Created by leading skincare expert Barbara Olioso these precious, frosted flacons really do hold all of the secrets of the forest and bring you luscious, delicious, nutritious skincare to enhance and beautify tired and lacklustre complexions . There are two steps to the treatment (which you can also use separately) consisting of a fabulous facial oil and a super scrummy serum. The great thing about this is that you can customise the system to suit your individual skin type by adding more, or less of each of the components and you can have fun experimenting too! The system stimulates your own collagen production and protects the existing collagen too. This process begins to lift sagging skin, reduces fine lines and wrinkles, reduces the appearance of dark circles and spider veins and is also suitable for the delicate eye area. I have been using the system for around a week now and I have to say that I saw a difference in my skin on the very first use! Whereas my skin was looking a little dull and dry it immediately gave me a healthy glow and the skin on my face (and neck and décolletage!) definitely felt smoother and more comfortable. Now you know I’m not one to blow my own trumpet but this magical, mysterious stuff made me look and feel like a million dollars and my dressing table is also looking much prettier too with those gorgeous glass bottles in their cool forest green and soft amber orange. Oh, and I almost forgot, Forest Secrets products are Free from parabens, synthetic fragrances, artificial colours, PEG's, GMO's, allergens, petrochemicals and silicones and Approved by the Vegan Society, the Vegetarian Society and The Women Environmental Network.